Heat oil in an electric deep fryer or cast iron pan to 375°F. You will need at least an inch and a half of oil. Line plates with paper towels, the process will go fast once you start! Note: You can use an actual funnel for this process, or even a zip top bag with one corner snipped off. Just as long as the batter is able to get into the oil quickly and efficiently, that’s all that really matters. Find more fair food recipes. Oh wow! I just had a GREAT idea! Adam’s birthday is in July, usually a week or two before the fair. It would be SO FUN to have a “fair” birthday party for him! Funnel cakes, corn dogs, cotton candy, maybe a bounce house. I’ll probably forget this by next summer, but thanks for inspiring me! Those sound tasty! We’ve made them a few times before. They are much more economical at home than at the fair!!! 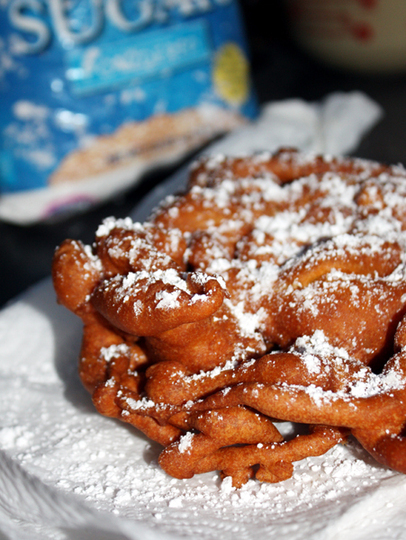 PS – Mary Poppins really has a thing for funnel cakes! !